It wasn’t always winter, as I spent some three years at the Couvent St. Joseph, but somehow winters were especially memorable. Each winter, on December 6th, was St. Nicholas Day, and all the children in the orphanage were taken as a group to visit him at the Gallerie Anspach, at the time the largest department store in Brussels. This was an annual visit to which all the children looked forward because the good saint, who loved children, always brought them presents. Only I had misgivings. Remember that this was Brussels, and that we were French-speaking. 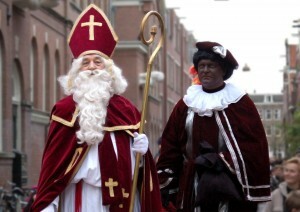 In French speaking Catholic countries, Santa was unknown at the time, but it was St. Nicholas who handed out gifts to children, about twelve days after Christmas. If you know your myths and legends about the saints, you know that St. Nicholas has always been known for his love of children, and that he rescued three little children who had been captured by an evil hostel-keeper while they were out too late gleaning a field for their impoverished mother. He had not only captured them, but he had also made them into chopped meat. By chance, St. Nicholas stopped at this hostelry for the night and dreamt of the children, and when he woke up he prayed for them and confronted the hostel-keeper. St. Nicholas’ prayer caused the three children to be restored to health and to their mother. All of us “Catholic” children knew this story, believed it and loved it. The only problem with the story was that it didn’t mention Croque-Mort, his evil African servant. His name in French meant “Bite the Dead,” (there’s also a story that undertakers once-upon-a-time, had to bite the big toe of the deceased before they buried them, just to make sure, you understand) and at the Gallerie Anspach, Croque-Mort always stood slightly behind and to the left of the saint. As the saint gave out presents to the good little boys and girls waiting on line that eventually sat on his lap, it was Croque-Mort’s job to grab those who had been bad, shove them into the potato sack he was holding, and usher them straight into Hell. Each year, as I advanced in the line to sit on St. Nicholas’ lap and get my present, I had a chance to think, carry out what might be called a practical examin de conscience . I had a chance to calculate my odds on getting a present or being grabbed by Croque-Mort and shoved into his bag, and while I was not an especially bad kid, each year I disliked the odds, dropped out of the line, and skipped getting my present. I still feel the Saint Nicholas of the Galleries Anspach owes me three presents, but in those days I was a worried child.